Q-Connect Feint Ruled Casebound Notebook 96 Pages A5 E00062 Pack of 1 Q-Connect Manuscript Books. Fully cased notebooks ideal for documenting important records. hard wearing linen effect cover endures heavy usage. Printed on high quality White ruled paper. A5 210x148mm (8.25x57/8). Feint Ruled. 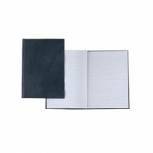 Q-Connect Feint Ruled Casebound Notebook 96 Pages A6 J00066 Pack of 1 Q-Connect Manuscript Books. Fully cased notebooks ideal for documenting important records. hard wearing linen effect cover endures heavy usage. Printed on high quality White ruled paper. A6 148x105mm (57/8x41/8). Feint Ruled. 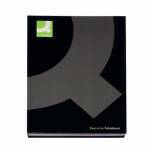 Q-Connect Hardback Casebound Notebook A4 Black (Pack of 3) KF03725 Pack of 3 Q-Connect Casebound Book. Premium quality notebook at an affordable price. Hard-wearing covers. Feint ruled. A4. 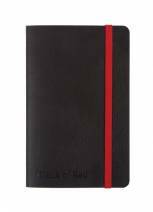 Black n' Red Smart Ruled Casebound Hardback Notebook A4 100080428 Pack of 1 Black n Red casebound hard back book with Smart ruling system for organised note-taking. features left-hand column for bullets or numbering and two right-hand columns for actions and deadlines. High quality 90gsm smooth paper for minimal show-through. Black n' Red Ruled Perforated Wirebound Hardback Notebook A4 (Pack of 5) 100102248 Pack of 5 Black n Red Wirebound Notebook with hard backed laminated Black covers and Red wire binding so books lie flat when open. A4 297x210mm 140 pages. Feint and perforated. Pack 5. 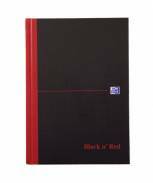 Black n' Red Feint Ruled Casebound Hardback Notebook Ruled A4 (Pack of 7) 100080446 Pack of 5 Black n Red Manuscript Book. Fully casebound notebook with bound writing pages sewn into the spine. A4. 192 pages. Ruled. 7 for the price of 5 with 2 FREE books in every pack. 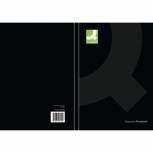 Q-Connect Hardback Casebound Notebook A5 Black (Pack of 3) KF03726 Pack of 3 Q-Connect Casebound Book. Premium quality notebook at an affordable price. Hard-wearing covers. Feint ruled. Size: A5. Q-Connect Casebound Index Notebook 96 Pages A4 F00059 Pack of 1 Q-Connect Manuscript Books. Fully cased notebooks ideal for documenting important records. hard wearing linen effect cover endures heavy usage. Printed on high quality White ruled paper. A4 297x210mm. Indexed. Q-Connect Casebound Index Notebook 96 Pages A5 KF01064 Pack of 1 Q-Connect Manuscript Books. Fully cased notebooks ideal for documenting important records. hard wearing linen effect cover endures heavy usage. Printed on high quality White ruled paper. A5 210x148mm (8.25x57/8). Indexed. 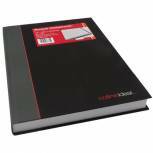 Black n' Red Recycled Ruled Wirebound Hardback Notebook A5 (Pack of 5) 846350962 Pack of 5 Recycled Black n Red Notebook A4 Ruled Feint L66518 with hard backed laminated black covers and red wire binding so books lie flat when open. A5. 140 pages. 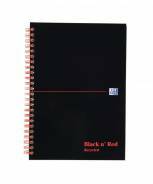 Black n' Red Ruled Wirebound Hardback Notebook A4 (Pack of 7) 846350115 Pack of 5 Black n Red Wirebound Book. Laminated glossy hard back. 140 pages of ruled 90gsm white paper. A4. Ruled Feint. 7 for the price of 5 with 2 FREE books in every pack. 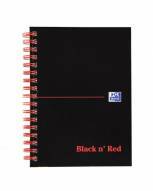 Black n' Red Soft Cover Notebook A5 Black 400051204 Pack of 1 Black by Black n Red Soft Cover Notebook A5. Flexible hardwearing cover. Optik 90gsm paper. Secure red elastic band closure. Ribbon marker. Storage pocket on the inside rear cover. 144 pages of ruled and numbered pages. Black. Black n' Red Soft Cover Notebook A6 Black 400051205 Pack of 1 Black by Black n Red Soft Cover Notebook A6. Flexible hardwearing cover. Optik 90gsm paper. Secure red elastic band closure. Ribbon marker. Storage pocket on the inside rear cover. 144 pages of ruled and numbered pages. Black. 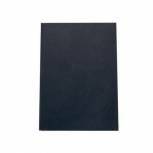 Collins Ideal Feint Ruled Casebound Notebook A5 468R Pack of 1 Ideal manuscript book feint ruled. Fully casebound and printed on high quality white wove paper. A5 210 x 148mm. 192 pages. 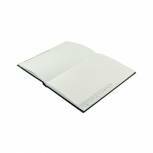 Collins Ideal Feint Ruled Casebound Notebook 384 Pages A4 6448 Pack of 1 Ideal manuscript book feint ruled. Fully casebound and printed on high quality white wove paper. A4 297 x 210mm. 384 pages. 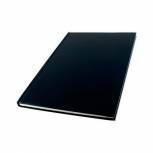 Silvine Feint Ruled Casebound Notebook 192 Pages A4 (Pack of 6) CBA4 Pack of 6 Silvine Manuscript Book. Quality casebound book with 96 leaves of 80gsm. 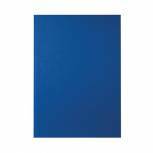 Feint ruled paper with an attractive hard wearing blue cover. Supplied individually wrapped. Size - A4 297 x 210mm. Pack of 6. 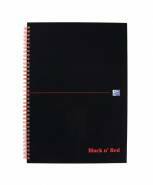 Black n' Red Ruled Perforated Wirebound Hardback Notebook A6 (Pack of 5) 100080448 Pack of 5 Black n Red Wirebound Notebooks. 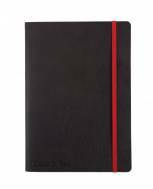 Stylish functional notebooks with hard backed laminated Black covers and Red wire binding. Size A6 148x105mm. 140 pages. Ruled Feint with perforated sheets. Pack 5. 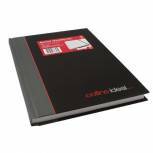 Black n' Red Casebound Hardback Notebook 192 Pages A5 (Pack of 5) 100080459 Pack of 5 Black n Red Casebound Book. Fully casebound notebook with bound writing pages sewn into the spine. Size A5 210x148mm. 192 pages. Ruled. Pack 5. 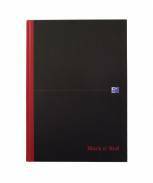 Black n' Red Ruled Casebound Hardback Notebook A4 100080473 Pack of 1 Black n Red Manuscript Book. Fully casebound notebook with bound writing pages sewn into the spine. Size A4. 384 pages. Ruled.